Director: Joshua Weinstein, US/ Canada/Poland, 2017, 82 mins. 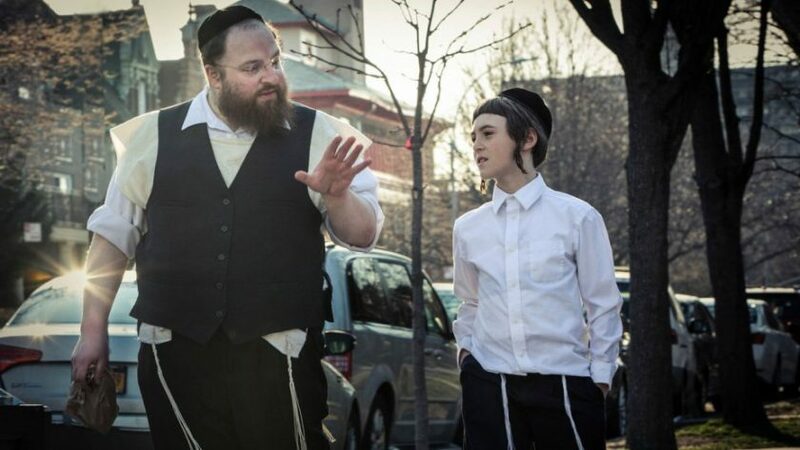 There are lots of good things to savour in this film about a very ordinary man struggling to earn money and fighting to keep his son living with him in the very Jewish orthodox community where he lives in New York. One of the astonishing facts about the movie is that the star is just an ordinary person, not an actor at all. The non-professional Menashe Lustig, whose own life forms the basis of the story, had not only never appeared in a film, he had not been inside a cinema. That the film is in Yiddish which very few of us speak or understand is soon forgotten as we are caught up in this strange community. Menashe (Lustig) is a widower whose wife died of cancer under a year ago. His Rabbi tells him that the religious order that he belongs to says that according to Hasidic tradition he has to remarry so that his young son, Rieven (Ruben Niborski), can continue to live with Menashe in a two- parent family. It is far too soon for the still grieving Menashe to consider remarriage but neither does he want his son to live with his brother-in-law Eizik (Yoel Weisshaus) and family. Living and working in Brooklyn, Manashe struggles in his job and has difficulties living alone and bringing up his son although he desperately wants to earn a living and to look after Rieven. Lustig is almost perfect as Manashe and we feel we really know him by the end of the film. And his scenes with his son – played magnificently by young Niborski – ring so true that you can believe that they are actually related. Director Joshua Weinstein knows the community well and directs his mainly non-professional Yiddish speaking actors so that we feel we are entering this hidden and – for most of us – unknown world. Giving a completely different view of bereavement, father-son relationship and loneliness, this is indeed a film which is completely unsentimental and yet very moving.